Simon Gerrans (Orica-GreenEdge) grabbed the victory on Old Willunga Hill in stage five of the Santos Tour Down Under, making up for the disappointment he experienced on the same stage last year, when he was edged out by Alejandro Valverde. This year, he came past upstart Tom Jelte Slagter (Blanco) in the final hundred meters to take a satisfying win on Australia Day, although after winning overall last year, Gerrans is out of the general classification picture after faltering earlier in the week. With Slagter’s second place finish, the GC picture does become more clear, as the young Dutchman grabbed a six-second bonus as well as a time advantage over previous overall leader Geraint Thomas (Sky Procycling). Slagter now owns a 13-second advantage over Javier Moreno (Movistar), who attacked on the final ascent of Old Willunga and ended up in third on the stage. Jon Izagirre (Euskaltel-Euskadi) was fourth and moved up to fourth overall. Thomas finished outside the top ten on stage five and drops to fifth. Ben Hermans (Radioshack-Leopard) occupies third overall and should end up on the final podium with the 90km sprint stage around Adelaide on Sunday. Moreno and Tiago Machado (Radioshack-Leopard) were most aggressive as the bunch hit the Willunga ascent for the second and final time. Thomas was being paced by a ruthless Edvald Boasson Hagen (Sky Procycling), with Slagter lurking on the wheel of the ochre jersey. Gerrans made his move with 1km left to climb, with Jon Izagirre trying to attach. Gerrans caught and passed Moreno, but just as he did, Slagter appeared on the wheel of both, with no sign of Thomas. Moreno was dropped and Slagter eventually came around Gerrans as the crowd roared them toward the line. Gerrans was able to grab the wheel of the flying Dutchman and used his superior sprint to pip Slagter on the line, although Slagter was gracious in defeat, knowing that he would be punctuating the greatest week of his professional career with the ochre jersey heading into Adelaide. After suffering through a week of misfortune, Gerrans sounded relieved and excited to pick up the stage victory on Australia Day. “I was pretty disappointed to drop out of contention on stage two, and I knew I had one chance to make up for it today, so to win on Aussie Day is an awesome feeling,” Gerrans stated. “I have to thank my teammates, and I’m glad I could finish it off. Thomas was disappointed, but sounded as if he would see the glass half full when looking back at his challenge for the overall win, a chance he lost inside the final 500 meters of Old Willunga. “The legs went with 500 to go,” he explained to reporters afterward. “All the boys did a great ride. Maybe I should have swung over [instead of leading his group toward the line]. I was kind of on empty, and when Gerro came past, he was too quick for me to grab his wheel. I really lost it with 400 meters to go. As expected, UniSA were celebrating Australia Day from the drop of the flag, triggering a host of accelerations early on, although no one could make anything stick right away. Approaching ten kilometres in, a group threatened to get up the road, but it quickly grew too large and the peloton had it reeled in. Thomas De Gendt (Vacansoleil-DCM) helped spring the next move, dragging a host of riders with him, though Maxim Iglinsky (Astana) crossed to the break with several others, again forming too big of a group. De Gendt attacked again, this time with team-mate Tomasz Marczynski the lone man in tow. Five more came across and the peloton made a brief chase before Sky Procycling and Thomas called off the pursuit, pulling over to answer nature’s call and allowing the De Gendt-led break to pull out a significant margin. De Gendt, Marczynski, Manuele Boaro (Saxo-Tinkoff), Klaas Lodewyck (BMC Racing), Calvin Watson (UniSA), Koen de Kort (Argos-Shimano), and Jens Mouris (Orica-GreenEdge) soon fell into a rhythm, with De Kort the best placed overall, at 2’52” behind Thomas. Sky, Radioshack, Saxo-Tinkoff, and Euskaltel-Euskadi all established a presence at the front of the peloton, and both groups settled in for three long circuits before Old Willunga approached. Halfway through the stage, the gap to the break reached its pinnacle, at just over 4’30”, before Blanco and Lotto-Belisol hit the front with authority. Blanco would do most of the work over the next 30 kilometres, primarily with powerhouses Maarten Tjallingii and Graeme Brown. They cut the gap to the seven leaders in half relatively quickly, and continued to eat into their advantage as Willunga loomed large for the first time. With 25km to race, Omega Pharma-Quick Step gave brief assistance to Blanco in the peloton, and with the break large in their sights for the first time, De Gendt got antsy and tried to edge away. But Boaro pulled the rest of the break across, and De Gendt and several others quickly lost interest as the peloton approached. Marczynski continued to fly the Vacansoleil colours however, and pushed on alone, starting Old Willunga for the first time as a solo leader. Boaro and Mouris made a brief chase of the Polish rider, but they too were soon sucked in by the shrinking main bunch, leaving Marczynski as the last holdout from the break. To set up Moreno, Movistar sent two lieutenants up the climb in José Herrada and Eros Capecchi. They were joined by Guillaume Bonnafond (Ag2R La Mondiale) and eventually by Jurgen Roelandts (Lotto-Belisol), who impressively made quick work of the gap the trio had built. Marczynski grabbed on briefly before blowing up completely, and the new leading group of four went over the top of Old Wallunga with around 15 seconds in hand on the bunch. With under 20km to race, and four men out front who posed no danger to Team Sky, team director Kurt Asle Arvesen called off most of his troops. Astana and FDJ pitched in to keep the quartet close, with Movistar and Lotto-Belisol off the hook with men up the road. Roelandts blazed the descent and opened a gap, but sat up as the road flattened out, choosing against trying the remaining kilometres alone. With 8km to race, their gap was just 15 seconds, but the peloton eased up, turning 15 seconds into 40 as Old Willunga kicked up a second time. It was Radioshack-Leopard and Jens Voigt who sped into the base of the climb. Bonnafond was trying to hold off the charging bunch, but the four men were quickly swallowed up, and Radioshack sprung Machado, who was going for ochre. Ivan Santaromita (BMC Racing) and Peter Velits (Omega Pharma-Quick Step) attached to him, putting three men up the road now, as Boasson Hagen assumed leadership of the peloton, with Thomas just behind and Slagter shadowing him. Velits and Machado each tried several accelerations, but neither possessed the spark to rid his opponents or the peloton. With 1500 meters to go, Moreno made his move out of the bunch and had soon bridged to Machado and company. A Vacansoleil-DCM rider also bridged the gap, but all were basically together under the one-kilometre banner. Gerrans and Jon Izagirre were now leading Thomas with Boasson Hagen used up and Thomas left to fend for himself. Moreno eased out front alone, but Gerrans timed his attack well and moved up to the Movistar rider. It appeared that Gerrans and Moreno would battle for the stage win, but a switchback had hidden what was going on behind. Thomas had started to wear down and Slagter sensed his moment, blasting up to Gerrans and Moreno. The Movistar rider was by this time starting to fade and Slagter sprinted around both, although Gerrans had plenty of energy left to stick with the Blanco rider. 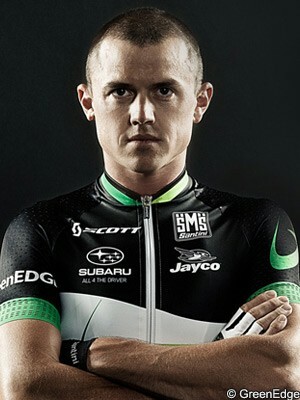 Gerrans took the final left-hand bend with 75 meters to the line behind Slagter before sprinting around and hanging on over Slagter’s final push. 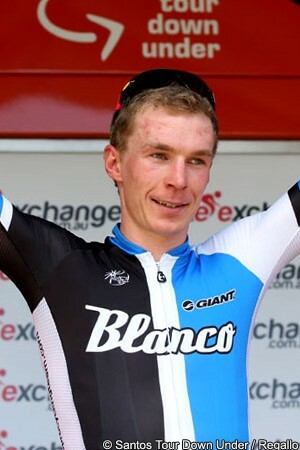 The Aussie got the stage on his country’s holiday, and the Santos Tour Down Under gets a likely new champion in Tom Jelte Slagter.